Mish's Global Economic Trend Analysis: Personal Income, Consumer Spending Rise Less Than Expected; PCE Price Index Negative; 4th Quarter Acceleration Coming Up? Personal Income, Consumer Spending Rise Less Than Expected; PCE Price Index Negative; 4th Quarter Acceleration Coming Up? Today's Personal Income and Outlays report came in below Consensus Estimates. Inflation is not building based on the Fed's favorite reading, the core PCE price index which inched a lower-than-expected 0.1 percent higher in September with the year-on-year rate steady and flat at only plus 1.3 percent. These results will not lift the odds for a December hike at the next FOMC. Income and spending data also came in below expectations, at plus 0.1 percent each vs expectations for plus 0.2 percent each. Income got no boost from wages & salaries in September which were unchanged following, however, strong gains of 0.5 percent in the two prior months that underscore this morning's employment cost index which shows pressure in the third quarter. Spending in September was pulled down by a 1.2 percent plunge in nondurable goods that likely reflects the low price of fuel. Spending on durable goods, driven by vehicles, rose a strong 0.8 percent with spending on services up a solid 0.4 percent. Other details include a 0.1 percent decline for the total PCE price index, again an effect likely based on fuel. 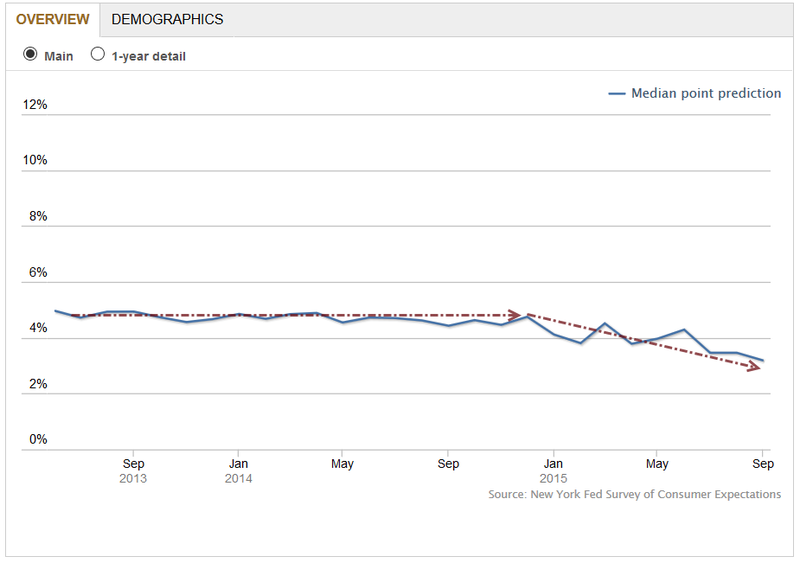 Here the year-on-year rate is barely over zero at plus 0.2 percent. The savings rate continues to edge higher, up 1 tenth to 4.8 percent in a gain that hints at strength for future consumer spending. Third-quarter consumer activity slowed in September, pointing to lack of momentum for October consumer data. Still, the consumer is in charge in the U.S. economy and, given low unemployment, the outlooks for holiday spending and fourth-quarter acceleration are favorable. Action in shippers except those most impacted by online shipping, store hiring plans, new home sales, and consumer spending expectations do not point to a robust acceleration in holiday spending. I sometimes wonder if Bloomberg reads its own reports. Let's take a look at the new home sales numbers that came out on Monday as reported by Econoday. The housing outlook just received a jolt! New home sales fell to an annual rate of 468,000 in September which is 67,000 below Econoday's low-end estimate and the lowest rate since November last year. Making matters worse is a steep 33,000 downward revision to August. The drop in sales together with a rise in homes on the market made for a big surge in supply, to 5.8 months from 4.9 months in August and 5.5 months from September last year. This turns around what had been a market of very thin supply to one of nearly adequate supply, with 6.0 months considered the balancing point between supply and demand. Homes on the market rose 4.2 percent in the month to 225,000 units. New home sales contribute to sales. People buy furniture, appliances, etc., etc. Testosterone Pit reports And Now Trucking is Suddenly Slowing Down. September is the beginning of the holiday shipping season. Volume should be sharply higher. But it’s not happening. US Freight Shipments Have Worst September since 2010. FedEx does expect increased volumes, but I would attribute that to online purchases. Increasing online purchases will not balance out weak in-store sales. Perhaps stores are mistaken, but they are not ramping up for holiday sales according to outplacement firm Challenger, Gray & Christmas is correct. For details, please see Weak Holiday Hiring Coming Up? 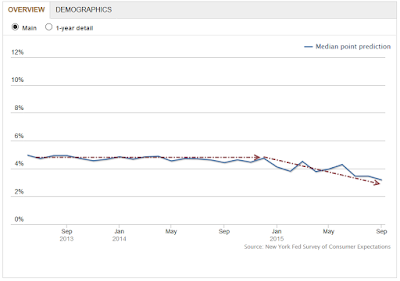 Every month, the Fed conducts a survey of consumer spending projections. Here are the results of the latest Fed Spending Survey. Something clearly happened to consumer spending expectations this year. Of course, consumers can spend away anyway. I don't know what they will do, nor does anyone else. Regardless, the signs seem to point to weaker or flat 4th quarter spending, not an acceleration.